Investors are hoping that a Fed rate hike leads to higher bank profits. 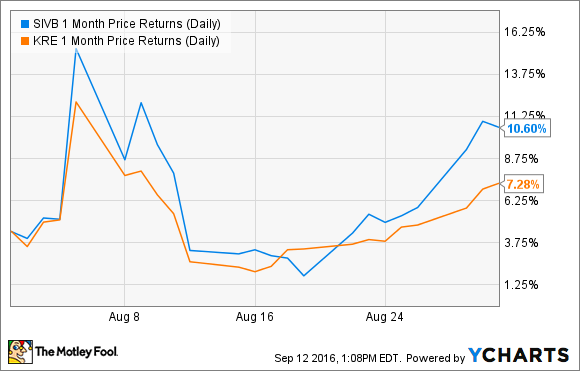 Here's why SVB Financial Group was a big winner. Shares of SVB Financial Group (NASDAQ:SIVB)the parent company of Silicon Valley Bank, rose by nearly 11% in August as investors handicapped the probability of a rate hike at the Federal Reserve's meetings in September and December. Regional banks broadly saw their share prices rise in August, as the SPDR KBW Regional Banking ETF (NYSEMKT:KRE) jumped by about 7% during the month. Regional banks are generally more "traditional" banks that earn more from the simple business of taking deposits and making loans than more sophisticated investment banks that derive more income from trading and underwriting fees. Naturally, because regional banks generate more income from lending, their earnings are much more sensitive to interest rates. An increase or decrease in interest rates has a greater impact on regional banks' profitability than larger banks that generate more fee- and trading-related income. SIVB 1 Month Price Returns (Daily) data by YCharts. SVB Financial Group is undoubtedly one of the most rate-sensitive banks on the market today. Notably, about 81% of its deposits were non-interest-bearing at the end of the second quarter, meaning that it does not pay any interest on the lion's share of its deposits. Meanwhile, about 51% of its total assets are held in the form of securities, primarily low-risk, low-return bonds and other fixed-income investments. SVB Financial Group should be a big winner in a rising rate environment. If rates rise, the bank will have the opportunity to move the proceeds from maturing securities into higher-yielding securities, while at the same time its deposit costs should increase at a much slower rate. The net result is a bigger net interest margin, or the difference between the cost of its liabilities and the yield it earns on its assets. In some ways, SVB Financial Group -- and all regional banks, for that matter -- are something of a speculative vehicle for investors to profit from fluctuations in interest rates. As the Federal Reserve contemplates its next rate increase -- traders recently pinned the probability of a rate increase at 21% in September and at 58% by December -- shares of rate-sensitive bank holding companies like SVB Financial Group have seen their share prices rise. For now, all eyes are on the Fed -- higher rates should be very good for SVB Financial Group, provided the central bank decides that it's time for a second rate hike since the last increase in December 2015.